S.S. Top, covers, conveyor guides and other parts for longer life . 'No container machine stops' saves valuable liquid and down time for cleaning. Steel frame is elegantly and systematically painted for corrosion resistance. Self centering device to take care of non concentricity of container to certain extant. High precision manufactured syringes to achieve high accuracy in fill size and drip proof performance. Minimum change overtime, from one size of container or fill size to another. Long Liquid collection tray with outlet below conveyor to Safeguards assemblies. Special designed nozzle and syringe in order to prevent liquid spillage in from on drop. 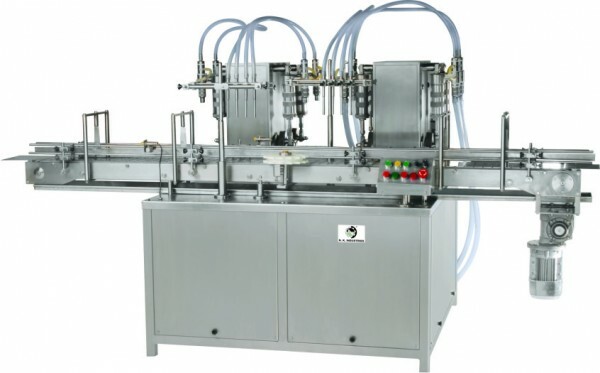 NKLFL-150, automatic volumetric liquid filling machine is a compact model used for filling of plastic and glass containers. Empty bottles are being received through the turntable and then they are fed on to the in feed conveyor of machine where the bottles are being separated as per constant pitch for next operation means filling. Imported, fiber optic sensor senses the Bottle and then gives the order to syringe system to fill the bottle as per required dosing. Then it is conveyed to the downstream machine for other operation.